So far, so good. Two days in and here’s another project for you! I can’t properly line a bag to save my life, so I’ve been experimenting with interfacing bags in probably the most non-professional, non-correct way possible. I’m a huge fan of Pellon’s Wonder-Under. Today we’ll be using a technique I like to call “Wonder-Under Sandwich.” You’ll see what I mean I used a lightweight Wonder-Under in these photos, but you might want to something a little thicker if you prefer a very sturdy bag. 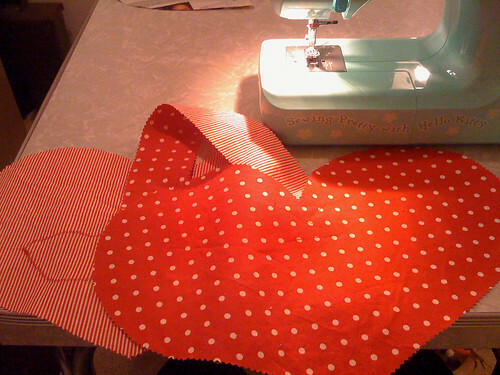 Start by laying a piece of fabric big enough for your template on your work space. Cut a piece of Pellon (Wonder-Under!) the same same size. On a hot setting, iron the Pellon onto the wrong side of your fabric. Let cool, remove the paper backing. 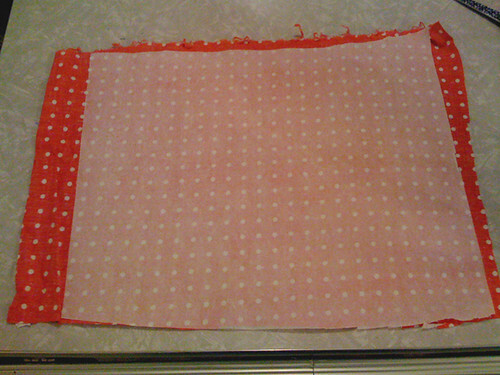 Next, select another piece of fabric (something that will look swanky on the inside of your bag). 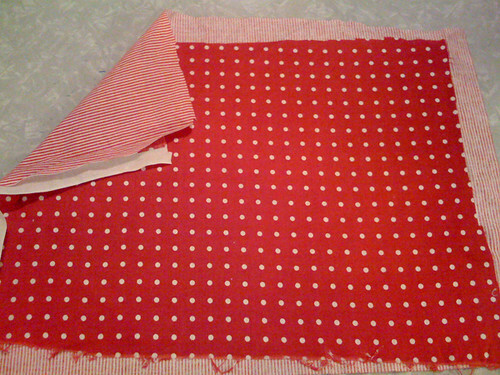 Lay this on top of your backed fabric (nice side pointing up), and iron onto the Pellon. We’ve now made a Wonder-Under sandwich, if you will. Repeat this process one more time so that you’ll be able to trace two hearts. After this, trace a heart on each Wonder-Under sandwich. 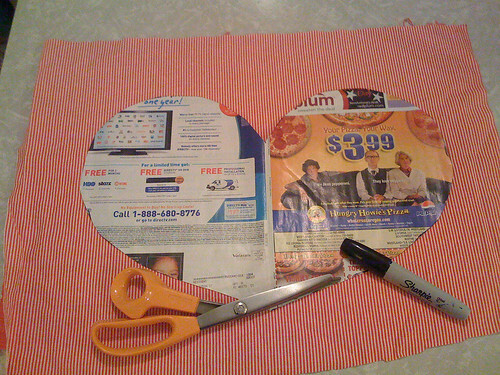 Cut out the heart with pinking shears. I traced my heart toward the top of my fabric so that I’d have scrap at the bottom that I could use for a handle and future projects. It’s time to start sewing. 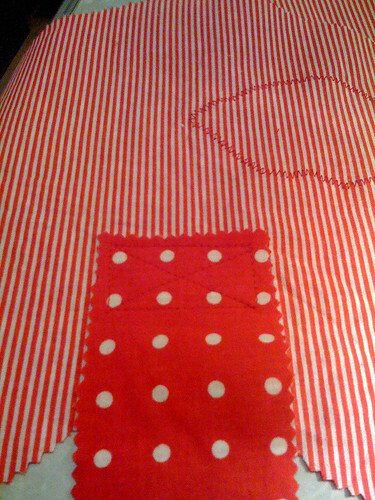 Position your handle in the middle of the heart, just below the “V.” Using a reinforced box stitch to attach the handle. Start with one heart, then do the other heart. As you can see below, you’ve got hearts on either end; they’re not going anywhere, mwah. Sew this puppy up. You’ve got your handle on, so simply line up the bag, inside fabrics facing each other. I used a basic chain stitch, but a ziz zag stitch might look nice here, too. 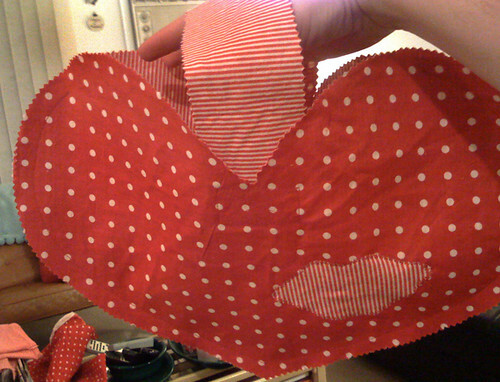 You’ll want to start and stop the sewing in the middle of each heart lobe so that you can get into your bag. Voila! I added some big lips to my bag. Feel free to add buttons, other appliques, etc. This bag is the perfect size for a skein of yarn, a pair of needles and some knitting trinkets. 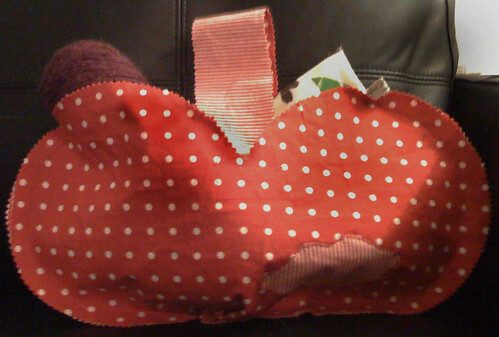 Look for my bag this Saturday with me at City Knits during the “Learn to Knit” class! Another reason I need to take up sewing. 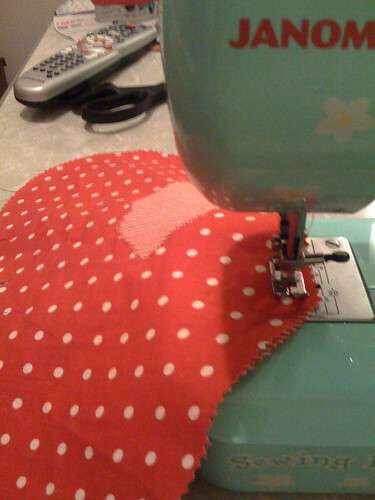 Love the Hello Kitty Janome! I hope your group will be inspired to help after looking at my web site and learning about my organization.